The chart attached is Brett’s rectified chart to Monday 12 noon when the hearings resume and when Christine Basely Ford is supposed to appear before the Senate. She is now calling for a full FBI investigation into her charges. She is not calling for DoJ, because she realizes that an FBI investigation will take forever and thus stall the Kavanaugh nomination until…well who knows? The problem we have with that is in the USA, people are innocent until proven guilty so the burden of proof is on her and not him to exonerate himself. Second a minor’s criminal record is wiped clean upon their 18th birthday and so is Blasey Ford wanting all of U.S. precedent to be overturned or should it just be done in this case? Either way that presents another quagmire. All of these issues made us relook at the Kavanaugh chart to see how certain asteroids line up. First there is Asteroid Li for Lie in the eleventh house at 12 Capricorn. It’s ruler is in his first house at Saturn 13. That is rather ominous position, suggesting as it does that jealous people from his past may come forth to besmirch him. In his case, those Lies will come from his youth in Columbia Maryland highlighted by the Asteroid Columbia at 11 Cancer. The rather small orbs here are striking. So Li is opposite Columbia and square Saturn which in turn is trine Columbia, suggesting that there are many “old and established” friends who will vehemently come forward to defend him (Saturn is opposite Mars and Uranus) via many forms of electronic communications — video, telephone, teleconference, email etc. Now the shoe drops, as all of this is then squared his Mid-heaven at 10 Sagittarius but here they have found a fierce warrior who is defending his career, family and life. Kavanaugh is fearless and this is the important part, blameless. While the Lies are semisextile to the Mid-heaven they are also fantastic being sextile Neptune in the ninth. In this chart, Europa is now fighting for their vindication and validation. They do not want to be a laughing stock like Anita Hill was so many years ago against Justice Thomas. She wants to be a hero but Europa is square Columbia at 11 Cancer and thus opposite Li — yes these things go round and round because that is what a witch hunt is — lots of lies that have no proof but are damning to the individual involved. Will it work? Well Asteroid Columbia is sextile Mars at the descendant and the apex is Saturn in the first so the left will say that the Old Boys network saved him, but in reality the problem is that the apex in the first goes to Pluto 15 in Virgo suggesting that Kavanaugh finds new talents at his disposal as he combats this attack and reaches out to old friends to help piece this tragic puzzle together. Will Kavanaugh succeed against Blasey Ford? Well with Asteroid Freud, is partile his part of Fortune at 28 Aries and has the meaning of “a large disappointed audience,” suggesting the need not to take anything for granted. Freud, we chose because Blasey Ford has a doctorate in clinical psychology, is also semisextile Jupiter in the third and opposite Neptune. 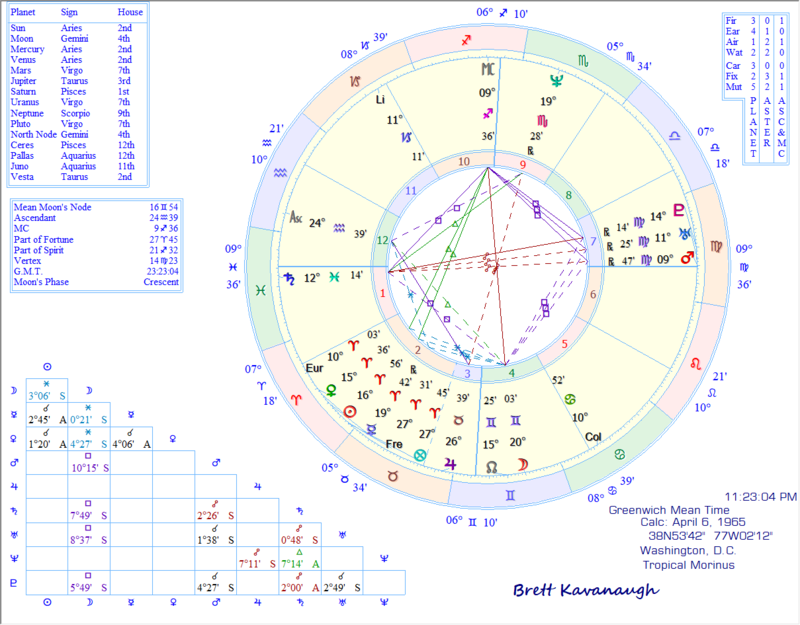 It would seem that this trial by fire for Kavanaugh is as much a mandate against him as it is on the political correctness that has run amuck, Neptune is square Mars opposite the old guard of Saturn 13 Pisces. He does have a few things in his corner, in particular, the North Node, protection, conjunct the Moon — suggesting protection against slander and lies from women. Aries 28 btw, has the keyword of Disjunction or to separate or to disjoin one that was together into separate parts, like wheat from the chaff.